Want to be notified of new releases in ZihengChen/ImageAlgorithm? Image Algorithm is a clustering algorithm based fast search and find of density peaks. 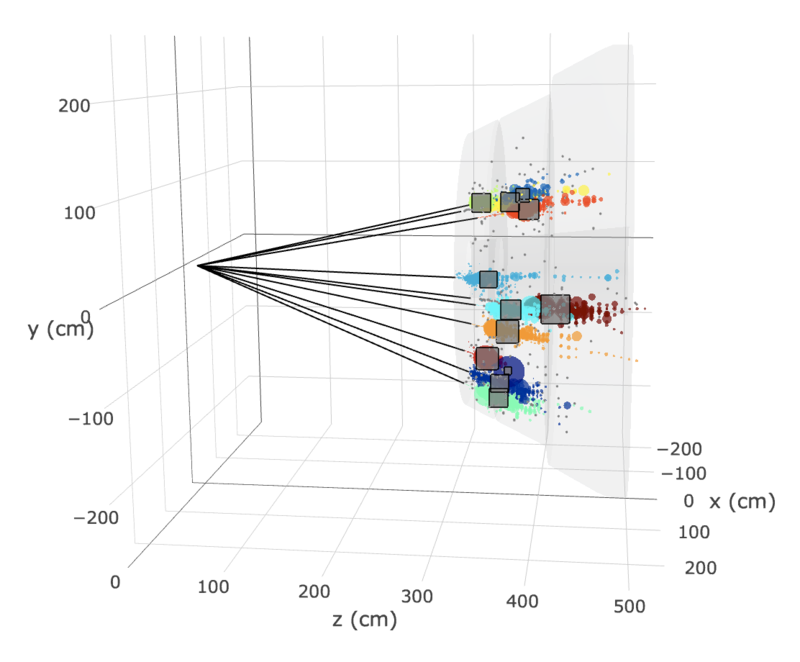 Comparing with other popular clustering methods, such as DBSCAN, one of the most prominent advantages of Image Algorithm is being highly parallelizable. This repository is an implementation of Image Algorithm for general purpose, supporting strong and easy GPU acceleration. For now, the implementation includes three backends: numpy, CUDA and OpenCL. It has been tested that all three backends give the identical clustering results. Therefore users can feel free to choose whichever faster and easier for their purposes. For all three backends, two kinds of data structure can be taken in: Flat list and kdbin. KDBin, bins in k-dimention, accommodates points inside spatial bins in k-dimention with dynamic bin distribution and flexible bin capacity. Techniqually it uses hashmap and a set of memory references to obtain nearest neighboring bins and points inside, such that query of neighborhood for each point is O(1) complexity. 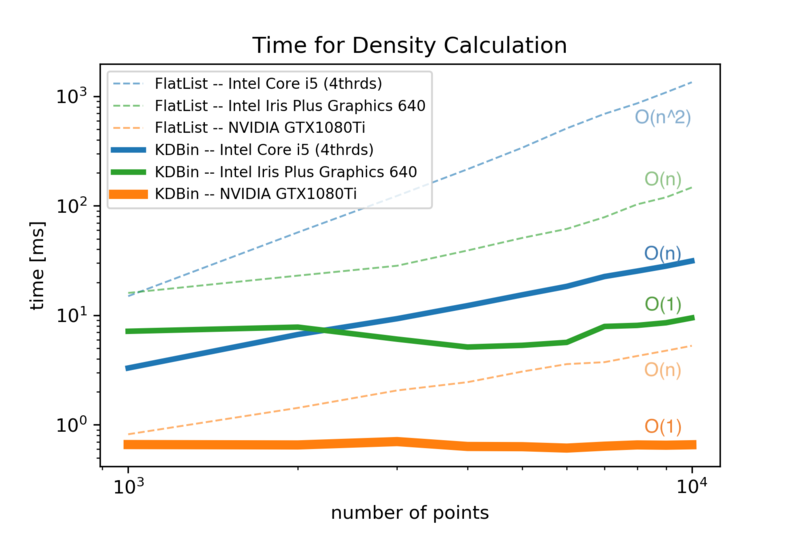 Performance test shows a strong acceleration in density calculation using KDBin data structure. For density rho calculation, performance tested is shown below. Calculate rhorank in CUDA/OpenCL via 'Merge Sorted List' for parallel sorting. Regarding dependency, no dependency is required for numpy backend. And it usually does a good job dealing with small dataset and needs no extra packages. However, for users wanting to use GPU acceleration with either CUDA or OpenCL backend, extra dependency is required. Declare an instance of ImageAlgoKD with your algorithm parameters. Then give it the input data points. 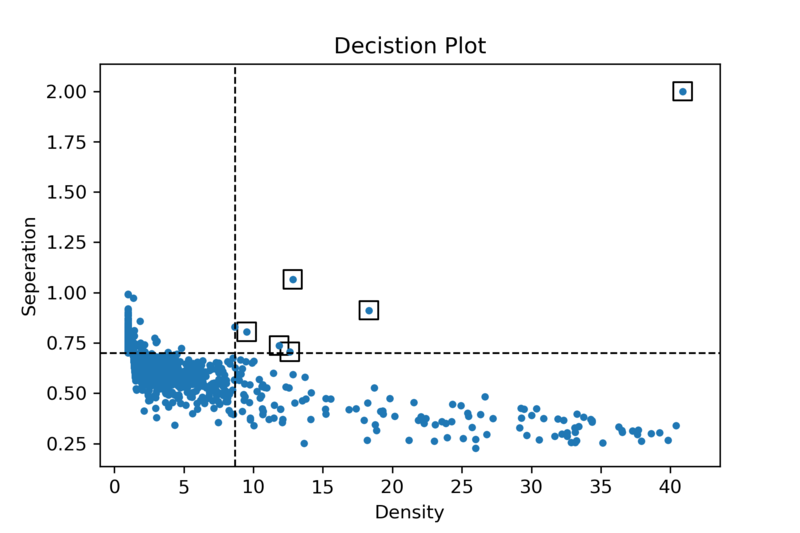 Then run the clustering over input data points. Perform IA clustering on 1000 toy 2D points, sampled from two Gaussian Distrituion and noise. The toy data is in data/basic.csv, while the corresponding jupyter notebook can be found here in examples/. 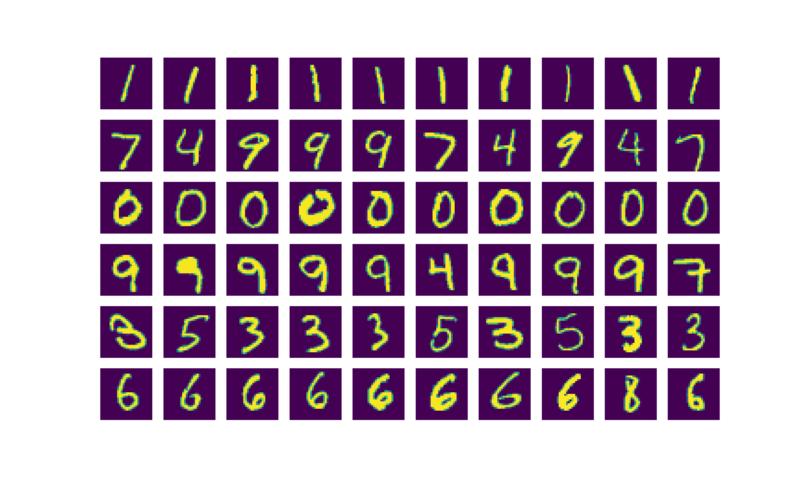 Perform IA clustering on 1000 MNIST 28x28 dimension points. The MNIST data is in data/mnist.csv, while the corresponding jupyter notebook can be found here in examples/.